Glowy: Elizabeth Banks in Sophia Webster Coco pointed toe pumps. Elizabeth Banks in Sophia Webster Coco pointed toe pumps. Elizabeth Banks was seen as she walked the red carpet at the 2014 LA’s Promise Gala held at Universal Studios Hollywood on Tuesday. The actress wore a Roland Mouret white sleeveless painted dress with a asymmetric neckline while holding a Edie Parker Fiona clutch and pairing up with Sophia Webster Coco pumps. 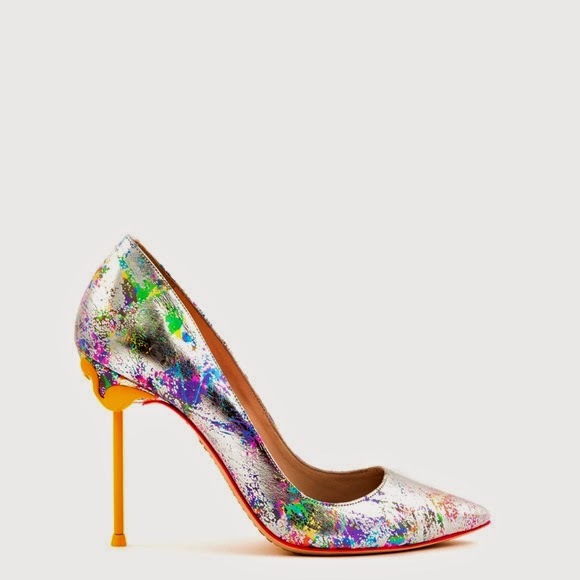 which features a metallic rainbow print silver patent leather, pointed-toe and 100mm orange stiletto heel. Her heels can be purchased at Sophia Webster, Nordstrom and Farfetch. Sophia Webster is one female designer i love and really hope to own some of her shoes one day.. Her shoes are playful yet cute and unique.